Not one to ignore a cry for help, the Doctor and the rest of Team TARDIS arrive on a moon that’s home to the Kerblam headquarters, a massive intergalactic delivery company (eat your heart out, Jeff Bezos). Besides the obvious reference to the corporate monster that is Amazon, Kerblam is giving me major New Who vibes. 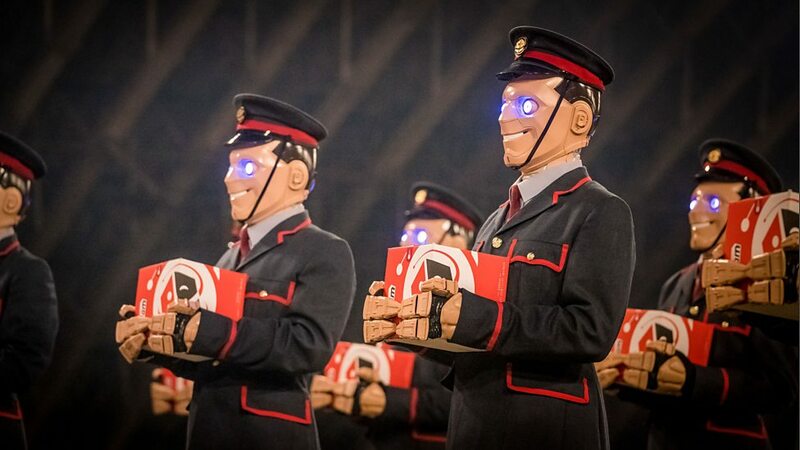 The numerous robots with an almost too-happy grin plastered on their faces reminded me right away of “The Beast Below,” and the corporate machine aspect was definitely a throwback to the “Long Game” episode of Series One when Rose and the Doctor found themselves on Satellite 5. Side note — did Ryan just make a joke by calling Yorkshire “The People’s Republic of South Yorkshire?” because we do the same exact thing with Cambridge where I am, near Boston. Interesting to know a lot of people are getting mileage out of that one. Anyway, moving on. In order to figure out who sent that distress signal, Team TARDIS splits up across the Kerblam distribution center in an attempt to infiltrate each department. 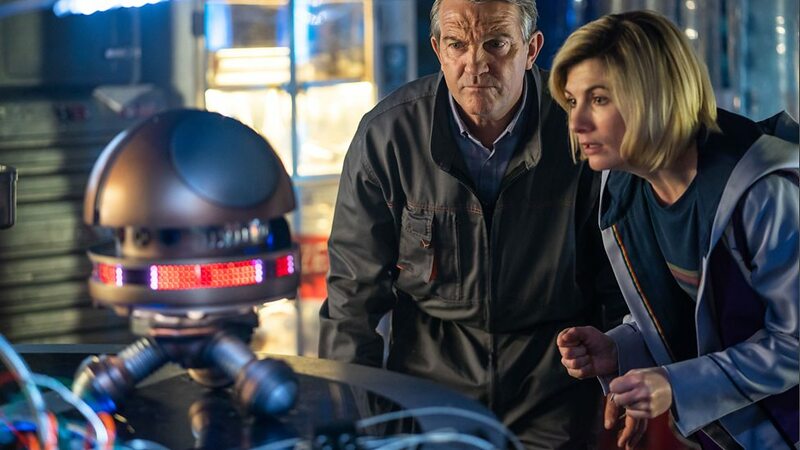 The Doctor switches spots with Graham in an attempt to get herself closer to the source of the packing slips, which hilariously results in Graham being assigned to janitorial duty. In fact, the whole team is split up with the exception of Ryan and the Doctor. Another side note — the Doctor’s face when she’s told she can’t sit on the conveyor? A+. Having everyone split up was a great way to allow each character to shine, something that’s been lacking for most of the season. We’ve had some great moments with Ryan and Graham, but Yaz has been noticeably underutilized. We see this especially when a Kerblam worker named Dan becomes fast friends with Yaz and then almost immediately goes missing, leading her to a dark corner of the warehouse where she has to think fast to escape some menacing Kerblam bots. Graham is also exceptionally clever by befriending the other janitor named Charlie in order to gain as much insider knowledge of Kerblam as possible. We also learn — surprise! — that life on a moon completely dedicated to capitalism isn’t the best place to be. Kerblam is plagued with strange power outages and missing employees, not to mention that only 10% of the workforce is made of actual people. Apparently this is something to brag about too, so I can’t imagine any other workplace is doing much better. All of this leads to a sinister plan by none other than the unassuming janitor, Charlie. As you can imagine, having the quota for human workers as small as 10% means life isn’t exactly easy for those who can’t find jobs. Every great-aunt’s worst fear has come true: the robots have taken our jobs. Charlie’s plan is to place microscopic bombs in Kerblam’s bubble wrap, which will ultimately cause the death of millions of Kerblam customers when they inevitably go to pop it, resulting in a decreased client base for Kerblam and a sharp decline in the trustworthiness of automation. He’s also responsible for the missing employees, who he’s been testing this bubble wrap on. Joking aside, Doctor Who is definitely going for a political parallel once again. Charlie even uses political sounding language, lamenting about the 90% versus the 10%. It’s the 90% he’s worried about, and apparently his only solution is to damage the public’s faith in technology in a way that is lasting and cannot be repaired. He even calls himself an activist, to which the Doctor quips “You’re not an activist, this is cold blooded murder.” Again, not so subtle with the analogies here. The Doctor manages to redirect each Kerblam bot’s teleport to the hangar were they’re being kept, causing them to essentially blow themselves up. It turns out that Kerblam itself sent the message for help to the Doctor, sensing that Charlie was preparing to do something terrible. It’s quite interesting that in this instance it’s the technology that is fighting for help rather than mankind. Although, “Humans are the bad guys in the end” can easily be overdone. Charlie’s arc suggested we as a society need to be careful about the amount of rights and opportunities we take away from human beings. This episode also compares Kerblam to Amazon in a pretty obvious way, so it’s odd that in the end they choose to stand firmly with the corporation. It’s pretty offensive to younger generations and labor activists that they chose not just Charlie as a villain, but Kerblam as the moral winner. Because, despite his willingness to murder, Charlie is right. Can you imagine living in a world where the human workforce being at 10% is a figure to be proud of? We’re supposed to feel bad for Kira and Dan, people who have been taken advantage of by Kerblam, but Doctor Who wants us to side with the business that started the suffering in the first place. It’s pretty disappointing, really. This episode was enjoyable and funny, with strong character moments and a great set design. The robots were the perfect mix of adorable and sinister, and the subject matter was intriguing until the end. It’s a shame all of this was wasted on a strange endorsement of corporate greed. To be honest, I’m not even sure that’s what the point of the episode was, but that’s certainly what it turned out to be. It was an attempt to be clever by making the “good guy” the “bad guy,” but it ended up being problematic and even a bit lazy. It’s almost like those strange comparisons that conservative news outlets like to do: the right is separating families at the border, but the left is refusing to serve fascists at a restaurant. Not a good look.